Phew, I am getting more and more into crystal growing last weeks. Few more specimens will be ready soon. Crystals of synthetic changoite, double sulfate of sodium and zinc. Here are some fresh crystals of a double sulfate of sodium and zinc with formula \(Na_2Zn(SO_4)_2\cdot4H_2O\). Natural variety of this compound is known as mineral сhangoite. It is not well known among crystal hobbyists, but definitely worth trying: it easily forms large, well-wormed single crystals; the crystals are very stable on air and not prone to dehydration; and finally, source compounds (sodium and zinc sulfates) are cheap and available. Remaining photos of this compound are in this gallery, and all my crystal growing photos are here. Shape and size of the crystals of sodium zinc sulfate. Crystals are colorless, monoclinic, having thick tabular form with multiple facets. Top faces have form of a distorted octagon, very close to a rectangle. On side faces, striations are sometimes visible. Tabs are slightly slant. Side view, striations are visible on the biggest crystal. My crystals are rather cloudy. 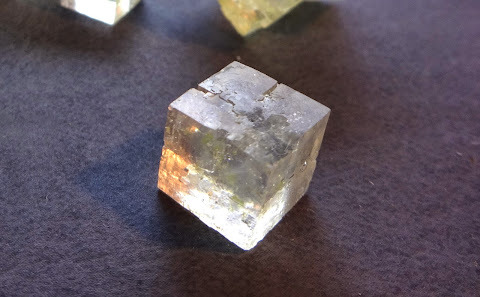 It would be really great to grow absolutely transparent crystals (by the way, I am now growing crystals of another zinc compound: zinc ammonium acetate, and they are crystal clear). Probably, additional recrystallization step could improve transparency. To grow crystals of changoite, prepare solution containing equal molar amounts of zinc and sodium sulfates. Indeed, both of these compounds can be bought in a chemicals store. However, they can also be prepared from commonly available materials. Take some acid and add small portions of soda until it stops fizzing. Looks simple, but in practice it is harder than it seems. Fizzing is very vigorous, so soda must be added really carefully to avoid spilling of acidic foam. Always perform this reaction over some larger vessel and wear eye protection! Moreover, gas bubbles are producing thin acidic fog, which is surely not good for health and surrounding objects. I used a piece of cloth to cover the reaction vessel. Upon drying, solid sodium sulfate decahydrate, \(Na_2SO_4\cdot10H_2O\) is obtained from the solution. Make copper sulfate solution and add soda by small portions until reaction (fizzing and sediment formation) stops. Remaining transparent solution would contain sodium sulfate. Do not throw away blue-green sediment of basic copper carbonate, it can be used for preparing other interesting compounds and beautiful crystals, such as copper acetate. The (questionable) advantage of this method is that it does not use dangerous acid. Zinc sulfate is a colorless solid, soluble in water. From water solutions, it crystallizes as heptahydrate: \(ZnSO_4\cdot7H_2O\). Besides the chemicals store, it can be sometimes bought as a fertilizer, since zinc is an important micro-element. However, the amount is usually small. It also can be prepared in several ways. This reaction is quite exothermic. Crystalline heptahydrate is obtained by cooling and evaporation. Beware of acidic fog, always cover the reaction vessel. Also, if zinc or acid are not pure, badly smelling reduction products can form, so ensure good ventilation. Remaining clean solution is zinc sulfate. The solution must contain equal molar amounts of both sulfates. For solid hydrated compounds, the proportion is: 1 part of \(ZnSO_4\cdot7H_2O\) per 1.12 parts of \(Na_2SO_4\cdot10H_2O\) (by weight of solid compounds). To grow crystals, solution must be saturated. Both compounds have very high solubility, so add only enough water to completely wet and cover the components. If after stirring and mild warming they are not completely dissolved, add a bit more water. Resulting solution should be transparent and slightly viscous. I used the usual growing procedure: slow evaporation. First let the solution to evaporate for a day or 2. Eventually, small rectangular crystals appear (if they are not appearing, then solution is too dilute). Harvest several most clean and well-formed seed crystals, attach them to a thread (I use thin nylon filament, and attach crystals to it by the double overhand knot). Then suspend seed crystals in the solution and wait patiently. Zinc is important element for life, but only as a micro-element. In big amounts, it is toxic. Swallowing 1-2 grams of zinc sulfate causes nausea, and 10-20g can be even deadly. However, with basic precautions, such as washing hands and not trying to taste the compounds, it is totally safe. In small amounts, such as 100mg/day, zinc is prescribed as a drug.